Regardless of the type of headaches you experience research has implicated cigarettes as a headache trigger. Whether you suffer from migraines, cluster headaches or tension ones, cigarettes are likely to intensify your discomfort and likelihood of experiencing the headaches. In fact, studies have shown that smokers experience a greater frequency of headaches and more intense headache pain. They are more likely to have other health problems such as depression and anxiety, both of which have been linked to headaches. The headaches are believed to be caused by increased blood flow to the brain, as well as impurities and other by-products contained within cigarettes. Nicotine in particular stimulates and encourages vascular changes in the brain, prompting painful headaches. Cluster headaches and migraines are two types of headaches where smoking shows a strong correlation and if you suffer from either of these headaches, you may experience notable benefits from eliminating cigarettes. People who experience chronic daily headaches are more likely to struggle to reduce the headache frequency if they are regular smokers. Cigarettes also increase the amount of carbon monoxide in your blood, which will further contribute to headache pain. Second-hand smoke may be contributing to your headaches so don't assume that because you personally don't smoke, that you are free from the effects of cigarettes. People working in bars, pubs or nightclubs may find they are particularly at risk due to the regular exposure to cigarette smoke. Women who suffer from migraines may suffer from additional risks if they smoke and take oral contraceptives. Studies have suggested that the risk of stroke increases in some women with these criteria. If you are a woman in this category, your decrease in headaches from cigarette elimination may therefore be enhanced by other benefits. Speak to your doctor about your decision to quit and he or she will likely have suggestions for appropriate ways to ease the strain and help to keep you as comfortable as possible during the process. It's important that quitting is done under your doctor because prescription aids may be suggested and it will also ensure that any other health problems are monitored during the withdrawal period. Ironically, you may experience more headaches during the quitting process, which can be discouraging and you may have second thoughts about your decision to quit smoking. You may choose not to eliminate cigarettes completely and instead, reduce the number you smoke each day. 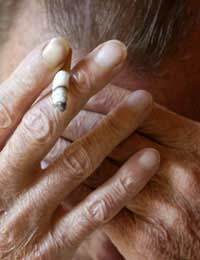 Even a reduction in cigarettes smoked, however, may still provide benefits with regards to headache treatment. Support - try to establish a supportive network of family and friends. Counselling - if stress was underlying your decision to begin smoking, it may help to address the root cause now. Exercise - not only can exercise help your headaches in itself, but it can also help distract you from smoking and increase production of endorphins, your body's natural painkillers. Acceptance - you may relapse once or many times but accept that this is part of the struggle and resolve to start again with determination to quit. Ultimately, you have to decide if you are willing to reduce or eliminate cigarettes from your life in your quest to obtain headache relief. There is support available and not only can you help your headaches, but you also reduce your risks of many other tobacco-related diseases.